Paco Díaz (Palma de Mallorca, Spain) on 2 September 2010 in Art & Design. Cómo les gusta el dorado a los rusos, eh? Un saludo Paco! Superbe fontaine , l'or coule à flot !! quelle architecture ! Phil. It looks even MORE BEAUTIFUL than when I visited !!! I'm glad they have refurbished everything! These gardens are an amazing place to be, even if it were for just several hours! Magnifique cette fontaine, un vrai trésor!!! Bonne journée. Quelles chutes ! Ton angle est parfait pour qu'on en profite à plein. Gran imagen Paco. El lujo desorbitado que representa da qué pensar en lo que ha ocurrido siempre y en todas partes, unos pocos tanto y la gran mayoria tan poco... Saludos. great composition . fabulous place ! Wonderful capture! I love this fountain and your composition. The light is perfect with such gorgeous golden tones. Fantastic! 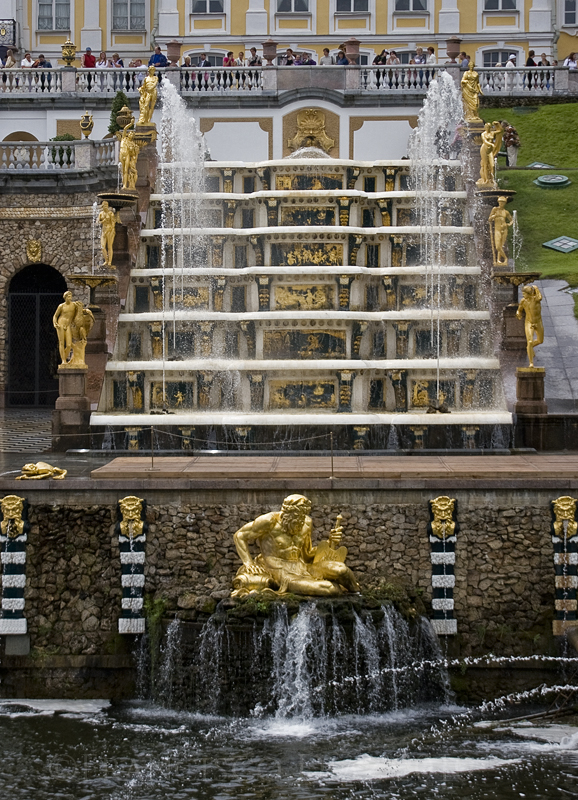 Ah, here we go with the impressive fountains of Peterhof! A very splendid water feature Paco, and a fine looking terrace to sit and enjoy a beer. Very well seen and done ! Magnificent, Francisco - with amazing detail. Bravo. Muy buena serie! -se nota que disfrutaste de viaje!! ;-) Buenas noches! A beautiful shot of this impressive fountain. I guess it was good to be Czar, well before 1917. Now that's a water fountain! Great capture!